On June 1st , 2008 G.O opened new installations. 4,000 m² destined for sales offices, R+D+i department and a warehouse for stocks of finished products. 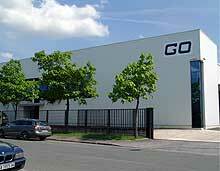 This new G.O installation consolidates the production group, fully organised to follow a perfect manufacturing line. In the very near future we expect to hold stock covering the 1 to 50 Tn excavator operating weight range for immediate delivery. SMOPYC has been the venue chosen to announce the export agreement between BIURRARENA and G.O. Prompted by the market demand for hydraulic couplings, G.O is developing its second generation GO-MATIC coupling.